This week, Sen. Flake will join his colleagues on the Senate Judiciary Committee to hold confirmation hearings for Judge Neil Gorsuch to serve on the Supreme Court. You can visitflake.senate.gov/SupremeCourt for the latest from Sen. Flake on the confirmation process. On the floor, the Senate will vote on the nominations of Charles Breyer and Danny Reeves to be members of the United States Sentencing Commission. The Senate will also consider resolutions of disapproval under the Congressional Review Act to repeal harmful federal regulations finalized under the previous administration. Last week Sen. Flake voted in favor of confirming Seema Verma for administrator of the Centers for Medicare and Medicaid Services, Daniel Coats for Director of National Intelligence, and H.R. McMaster to remain on active duty as a three star Army general in his capacity as National Security Advisor. Sen. Flake also voted to repeal an Obama administration regulation that placed limitations on who could be drug tested when applying for unemployment benefits. 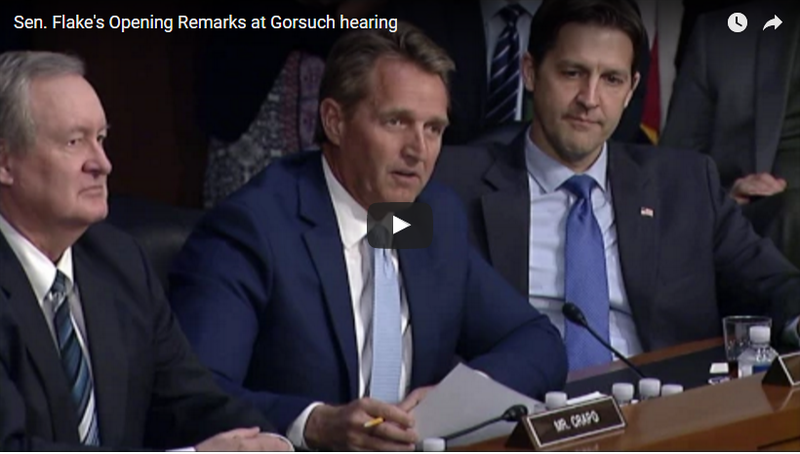 Sen. Flake delivered opening remarks at Monday’s Senate Judiciary Committee hearing in support of Judge Neil Gorsuch’s nomination to the Supreme Court. Watch the full remarks here. 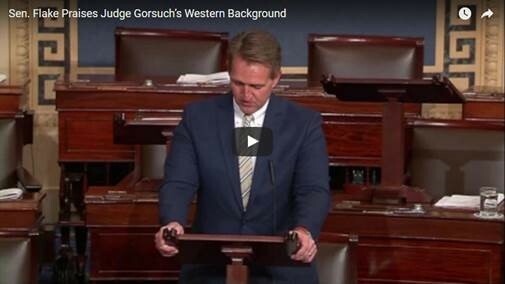 Sen. Flake highlighted Judge Neil Gorsuch’s Western values while speaking on the Senate floor in support of his nomination to the Supreme Court. Watch the full speech here. Taxpayer Super Hero: Business Wire reports on Sen. Flake’s record-breaking eighth “Taxpayer Super Hero” Award. 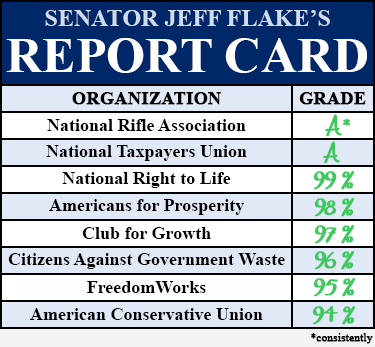 Given by the Council for Citizens Against Government Waste (CCAGW), the award recognizes Sen. Flake’s commitment to increasing government accountability by exposing waste and reining in spending. Read the full story here. #SourSixteen: The Daily Signal reports on Sen. Flake’s 2017 Waste Madness: Sour Sixteentournament bracket, an annual March Madness-themed culmination of his ongoing efforts to highlight egregious and unnecessary federal spending. Read the full story here. Detecting Flawed Detectors: Reuters reports on Sen. Flake’s bill to increase border security by eliminating onerous and duplicative hiring requirements for qualified applicants with military or law enforcement experience. Read the full story here. Zeroing Out 2.0: The Arizona Farm Bureau reports on Sen. Flake’s vote to repeal the Bureau of Land Management’s (BLM) “Planning 2.0” rule, which would have centralized land management decision-making with bureaucrats in Washington. Read the full story here. Using All of Udall: The Southern Arizona News-Examiner reports on Sen. Flake’s bill to resolve longstanding legal and bureaucratic obstacles from a 1989 land transfer that had prevented the City of Tucson from being able to fully utilize Udall Park for the benefit of the local community. Read the full story here. Tax BAT-tle: The Washington Post reports on Sen. Flake’s speech on the Senate floor last week urging caution on the Border Adjustment Tax (BAT). The editorial explains Sen. Flake’s concerns about rising costs for middle class families as well as possible disruptions of global supply chains and international trade relationships. Read the full article here. Leveling the PLA-ying Field: Reuters reports on Sen. Flake’s bill to lower federal construction costs and increase opportunities for underrepresented contractors. Read the full story here. 15 major league teams play in Arizona’s Cactus League. Travis from Chandler asks – Since the NCAA men’s basketball tournament expanded to 64 teams, which program became the first to defeat three No. 1 seeds en route to winning the national championship? The second correct e-mailer gets to submit the next question. 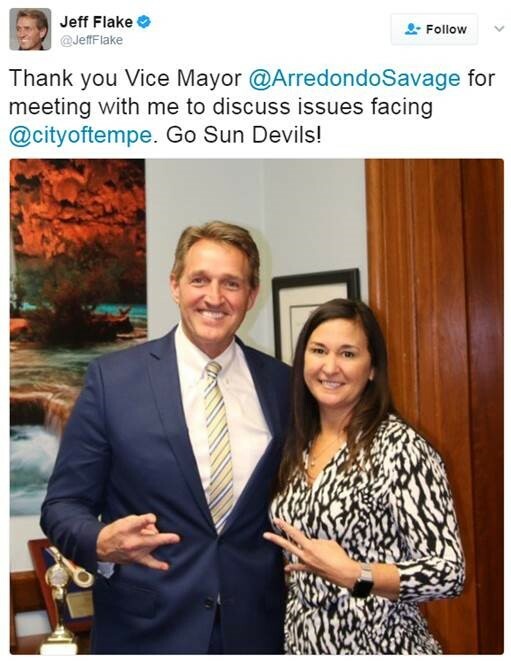 @JeffFlake Thank you Vice Mayor @ArredondoSavage for meeting with me to discuss issues facing @cityoftempe. Go Sun Devils! From the hearing room to the Senate floor, don't miss out on the very latest from Washington. Click here to begin receiving breaking news alerts and updates from Sen. Flake as they happen.